Video of Etching Process -- Briony Morrow-Cribbs demonstrates how she creates a copperplate etching. Video of Intaglio Printmaking Process -- The lines of the image are incised, or cut, into a metal plate. This can be done with sharp tools, as in engraving, or with acid, as in etching and aquatint. Ink is applied and forced into the incised areas. Ink remaining on the surface is removed, and the plate is ready for printing. Video of Screenprinting Printmaking Process -- The artist creates a stencil and applies it to a piece of fabric (the screen) stretched over a wooden frame. Ink is pulled across the screen with a squeegee and forced through the openings in the stencil onto a sheet of paper below. 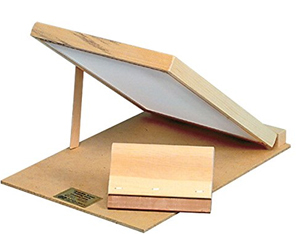 This unit has a Hardboard base and includes a 7-inch Squeegee, pre-stretched 12XX multifilament polyester fabric, as well as a kickstand and hinges with wing nuts for easy opening and closing during application process or adjusting for thicker materials. Set also includes 3 registration guides made of stainless steel for multi-printing. Full unit measures 10 x 14 inches. Video of Lithography Printmaking Process -- The artist draws on a stone with a greasy crayon and then covers the stone with a thin film of water. The oily ink sticks to the greasy image but not to the water-covered areas. Video of Relief Printmaking Process -- The artist carves the image on a block of wood or linoleum, cutting away some areas and leaving others raised (in relief). Ink is then applied with a roller which contacts only the raised areas, creating a mirror image. Glossary of Printmaking Terms and Processes -- A nice overview of printmaking from M. A. Goetzke. History of Printmaking & the Processes Used -- The Highpoint Center for Printmaking explains the various printmaking processes. How to Make Monoprints -- An explanation of how to create monoprints by Monoprints.com. Intaglio Printmaking Made Simple -- Provides an overview of the five traditional intaglio processes: engraving, etching, drypoint, aquatint and mezzotint. Golden Acrylic - Fast Image Transfers -- Online video demonstration shows how to use Golden Fluid Matte Medium to quickly and easily transfer a laser printed image to canvas, wood, or plexiglas. 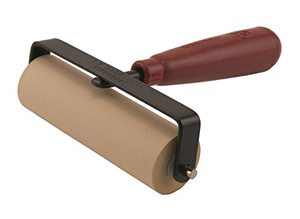 This brayer is ideal for all types of block printing. Use it with your favorite water-soluble or oil-based block printing inks. It is made from soft, natural Latex gum rubber with a precision ground finish. The flexibility of the 40/42 durometer makes for even ink distribution. The brayer has a heavy duty steel frame that eliminates warping. It will not bend or break. New Directions in Printmaking -- Safer and environmentally friendly printmaking processes developed by Nik Semenoff. Using Solvents: Rules for Handling and Disposal -- Explains the characterisitcs of solvents and gives tips for proper ventilation, handling, storage, and disposal. Q & A -- Safety, materials, techniques, tips, printmaking terms, how to save money, and more. Printmaking Techniques -- Walter Ehrismann, Swiss painter and printmaker, discusses dry point, etching, and the aquatint process. Solarplate Etching: An Eco-Friendly Alternative to Traditional Etching -- Create intaglio, relief and photo-etching prints with extremely low toxicity. All About Paper -- Learn about the different types of paper that are available, and the various properties you should consider to choose the best paper for your particular medium. A great step by step guide for the block printing process. It explains how to carve properly and safely, and how to print by hand using more than one color. It also includes advice for selecting tools, paper, and ink. Teaches how to use safe, non-toxic materials and techniques for etching, lithography, and screenprinting. Learn the art of screen printing on paper or fabric using water-based inks. You'll find simple to follow instructions with in-depth explanations and step-by-step photographs. Learn about intaglio, woodcut, monotype, screenprinting and book arts. 600 black-and-white, 40 color photos. A valuable resource of methods used in making monotypes: imaging techniques, masks, stencils, collage, and mixed-media prints. Art materials don't have to be hazardous to your health or compromise your safety. Learn about nontoxic materials and safer art-making practices.